The GPCR (G protein-coupled receptor) community is suffering from an embarrassment of riches. For many years, structure-based studies relied on atomic structures of rhodopsin, and research was forced to extrapolate from these using homology models. But in the past few years, PSI researchers have revolutionized the field with new structures and new insights. A collection of five structures of CXCR4, solved by a team of researchers at the PSI GPCR network, is the most recent installment in this exciting story. CXCR4 is a chemokine receptor that regulates the migration of cells in the immune system. Chemokine receptors typically interact with a variety of chemokines, but CXCR4 is an exception, and is specific for the chemokine CXCL12. Together, they normally play an essential role in the development of blood cells, but they are also important in disease. For instance, communication through CXCR4 may promote the many pathological changes in cancer cells, including formation of metastases and abnormal growth of blood vessels. CXCR4 also plays a central role in infection by HIV, since it is the co-receptor that guides the virus into cells. 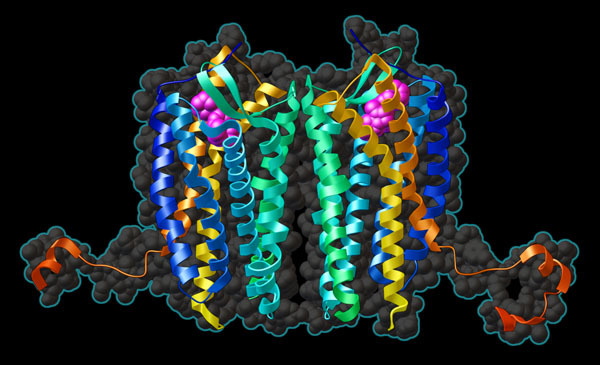 The structure of CXCR4 revealed the signature core of GPCRs: a bundle of seven alpha helices that criss-cross through the cell membrane. 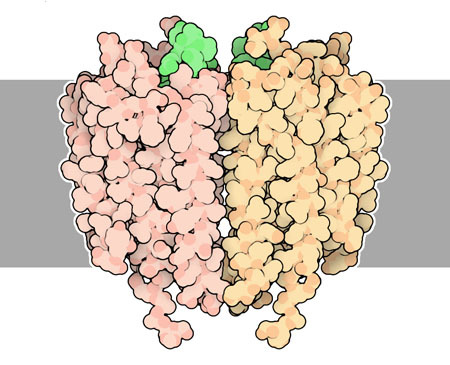 These are connected by a series of loops that are exposed on the two sides of the membrane and perform much of the work of recognizing the chemokine and passing the signal inside. The binding site is a cup-shaped depression on the outer surface. Crystal structures were obtained with a large cyclic peptide bound in the active site (shown at the top here from PDB entry 3oe0), suggesting how the chemokine might bind, and also with a small inhibitor bound (shown below from PDB entry 3odu), providing a place to start for design of anti-HIV drugs. Membrane proteins are always challenging targets for crystallography, because they need to be separated from their comfortable membrane environment. CXCR4 is no exception, so in order to solve the structure, the PSI team engineered a more cooperative form of the receptor. They clipped one of the intracellular loops of the receptor and inserted an entire molecule of lysozyme. The two-part protein folds correctly, is still active as a receptor, and with some coaxing, forms high-quality crystals for structure solution. Two structures of CXCR4 are overlapped here. One includes a cyclic peptide in the active site and the other is bound to a small inhibitor, called IT1t. Use the buttoms to flip between the two structures and notice that they bind in similar but not identical places in the binding site. You can also use the buttons to view the lysozyme (colored blue) that was fused in the receptor chain to assist with crystallization. Note that only one subunit is shown in each case--the receptor normally functions as a dimer of two subunits. Wu, B. et al. Structures of the CXCR4 chemokine GPCR with small-molecule and cyclic peptide antagonists. Science 330, 1066-1071 (2010). Alkhatib, G. The biology of CCR5 and CXCR4. Curr. Op. HIV AIDS 4, 96-103 (2009).